As I’ve mentioned, I wasn’t completely celibate in regards to baseball cards during my hiatus. While I was focusing most of my time on family and farm life, I did manage to have a secret tryst with a going-out-of-business collection from a local store. I managed to squirrel these cards away in my office, and would work on them during my lunch break. Over the course of a week, I went through each of the 21 boxes. To my surprise, there were a lot of cards in there that I did not have. Yet, there was still the mounds of junk wax. What made it worse was that since this lot came from a card shop, there were doubles. LOTS of doubles. In fact, 1,054 individual cards had more than 10 doubles. Wait, how do I know that? Well, after rummaging through the cards, I decided to punish myself and log each and every card into a spreadsheet. Yeah, you read that right. I counted and logged 65,316 cards, of which, 43,852 are doubles (Note: This doesn’t include about 5,000 minor league cards…beastly things). Not satisfied with just “counting” the cards, I made a database, which I uploaded to Google Drive. The database can be found under the “Inventory” link in the top right header. I made the database searchable, too. 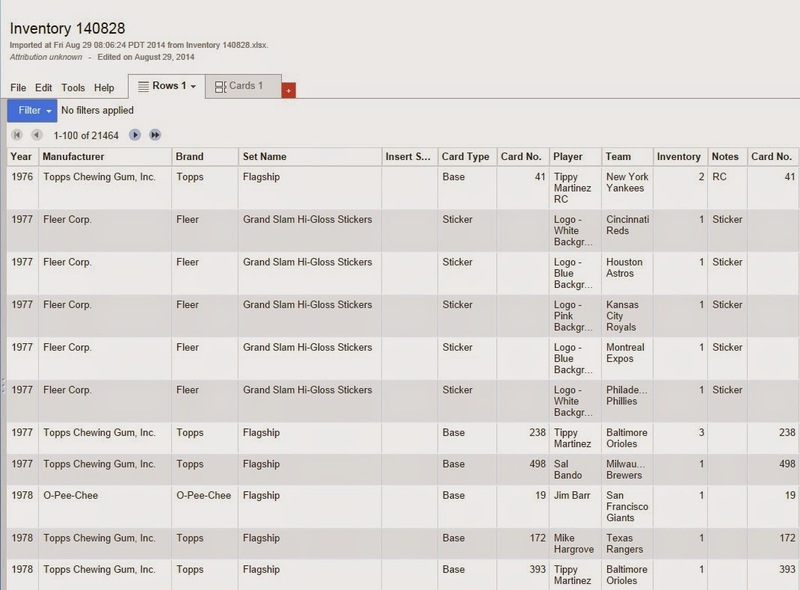 You can filter the results based on: Year, Manufacturer, Brand, Set Name, Insert Set Name, Card Type, Card No., Player, Team, etc. Now, I’m sure you’re asking why I did this. For one, it helps me figure out what cards I have, and by elimination, I can figure out what cards I need. But, I also created it for you. Personally, I do not like searching want lists, so I made my have list available. Granted, this is only a small sampling of what I have, but it’s a start. One day, I’ll have all the cards in there and then I’ll open the flood gates for trading (or purchase if you are so inclined). Enjoy searching the cards! OK, so you counted and logged 65,000-plus card and scanned 199 Craig Worthington cards. But looking at a want list bothers you. For what it is worth, it's only one scan of Craig Worthington repeated 198 times. Simple html copy and paste. As for want lists, I do go through them when I can, but there are A LOT of them out there. I figured why not have a means for people to check their want list against what I have. I guess we look at the same issue from different directions.